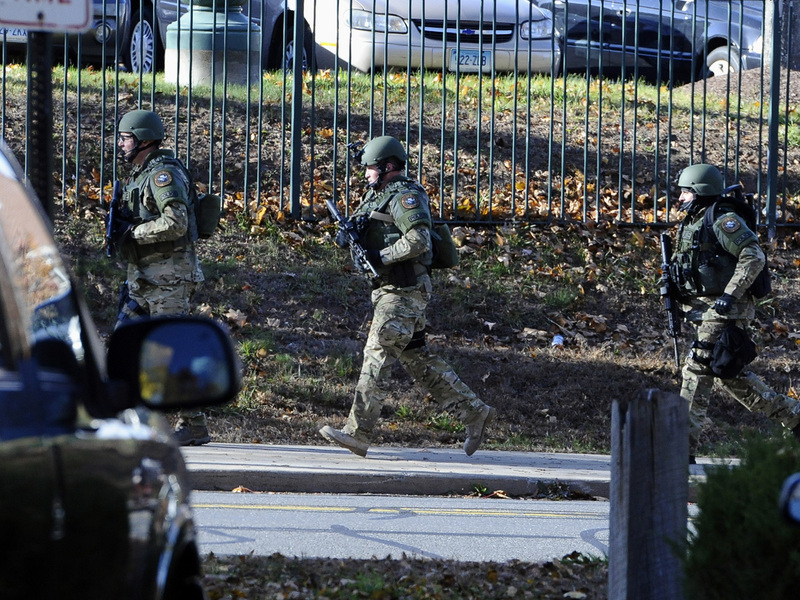 NEW BRITAIN, Conn. Three people "of interest are in custody", said Chris Cervoni, chief of police at Central Connecticut State University (CCSU), this afternoon following reports of an armed man that placed the school on lockdown earlier in the day. Cervoni confirmed that "at least one is a CCSU student," and all three being held are of student age. No weapons had been recovered as of yet, he added. Responding to questions about whether the incident could have been a prank, Cervoni said, "It wasn't a prank because there was concern, there was alarm." He added that the police is looking into if one of the men was wearing a Halloween costume. "In this situation, our prayers were answered," said Jack Miller, president of CCSU. Students who had barricaded themselves in their dorm rooms have tweeted pictures showing two men -- one white, one black -- in handcuffs. Police have issued the "all-clear," and school officials say the lockdown has ended. Classes for the rest of the day have been cancelled. Early this afternoon CCSU sounded a siren, and posted alerts on the university's website and via Twitter, telling students to to get inside buildings and stay there due to a "campus emergency." "This is not a drill," a tweet from the school said. #CCSU stay indoors. Seek shelter. Police are on the scene. This is not a drill. CBS Affiliate WFSB was told by numerous students of sightings of a masked man with a gun, or a man wearing camouflage and carrying a knife, entering a dormitory. Jordan Governale, a 20-year-old junior from Farmington, said he walked by a man carrying a backpack and with a sword and sheath strapped to his back. The man was wearing a mask, camouflage pants, knee pads and a vest resembling body armor, Governale said. A minute later he said he saw police responding. "At first I thought it was a Halloween costume. But after I saw the cops I thought it was some sort of threat," he said. "It's pretty scary. It's pretty strange, unexpected." Governale said he did not hear gunshots. Students reportedly barricaded themselves inside their dorm rooms at James Hall. About two hours alter, pictures were circulated on Twitter that showed two men, including one wearing what appeared to be camouflage pants, being escorted in handcuffs by police. More than 12,000 students attend the university, which has a 182-acre campus.